Director Clint Eastwood’s film adaptation of “Jersey Boys”, for the most part, serves to enhance what was already a fascinating and uniquely American rise-to-stardom story. Director Clint Eastwood’s film adaptation of Jersey Boys, the long-running hit Broadway musical featuring the history and the music of Frankie Valli and the Four Seasons, attempts to utilize the most distinctive structural elements of the stage production into what is essentially a biopic, and for the most part, his meticulous and patient approach to storytelling serves to enhance what was already a fascinating and uniquely American rise-to-stardom story. The transition from stage show into biopic isn’t seamless, however. In fact, some of the musical numbers incorporated into the film feel obligatory and even intrusive, as though Eastwood and screenwriters Marshall Brickman and Rick Elice felt so beholden and attached to the source material that it was unthinkable to them to omit certain songs that were used in the stage version. The result is curious, indeed: a film version of a musical in which some (not all) of the music is not only non-essential to the production’s impact, but is actually feels detrimental to it. 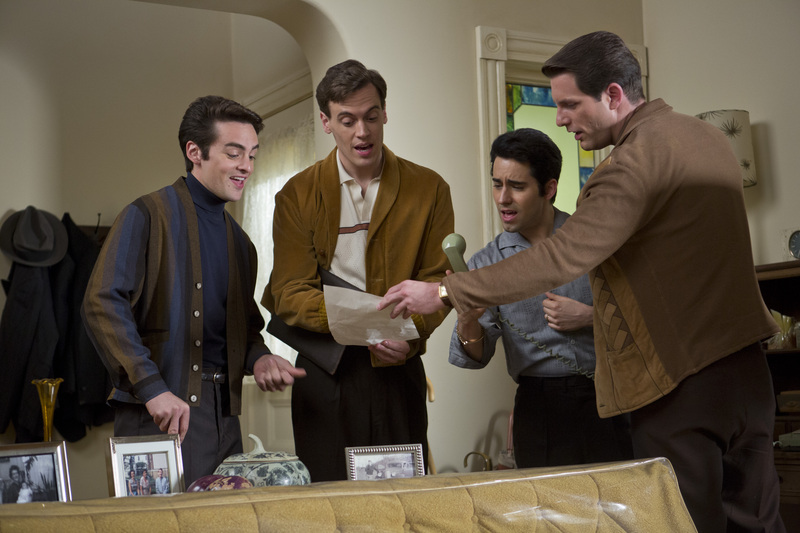 As it does on Broadway, Jersey Boys the film allows each of the original members of The Four Seasons — guitarist Tommy Devito (Vincent Piazza), songwriter/keyboardist Bob Gaudio (Erich Bergen), bassist/vocal arranger Nick Massi (Michael Lomenda), and lead singer Valli (John Lloyd Young) — to tell portions of the band’s story directly to the audience, colored by their own personalities and perspectives. Tommy narrates the group’s beginnings, their “Spring”, which includes his and Nick’s early run-ins with the law, their efforts together to keep Frankie out of trouble and help him develop his voice, and their introduction to Bob through a mutual friend from the neighborhood, a young Joe Pesci (Joey Russo). Bob takes over the fourth-wall-breaking narrating duties for the group’s “Summer” period, from their start as backup singers through the writing and recording of their first hits with producer Bob Crewe (Mike Doyle) to the peak of their success, marked by their appearance on the Ed Sullivan Show in 1962. From there, Nick Massi takes over, detailing the behind-the-scenes tensions and rivalries that brought about the group’s “Fall”, including Tommy’s ever-increasing troubles with mobsters and loan sharks, the collapse of Frankie’s first marriage and family life due to years of touring that kept him away from home for months at a time, and the original group’s eventual dissolution with Nick’s departure in 1965. Valli himself chronicles the “Winter” portion of the story, which details his efforts to rebuild his relationship with his daughter Francine as well as the rebirth of his career with his first major success as a solo artist, the release of “Can’t Take My Eyes Off You” in 1964. It’s important to note that the original Jersey Boys stage production took tremendous liberties with the actual chronology of real-life events that it dramatized in order to make those events fit into the “four seasons” structure, and the film follows suit. Similarly, the songs act almost like signposts or landmarks in the timeline of the rise and fall of The Four Seasons. Thus, the inclusion of some of the songs in Eastwood’s film version is certainly necessary, and would have fit as organically as they do on stage for their value as being symbolic of the emotional tone of the story in particular moments. Some of them. Not all. As strange as this may sound, Eastwood perhaps does too good a job at opening up the world in Jersey Boys in order to tell the story in a cinematic way. He takes full advantage of what film can do that even the most elaborate stage production cannot: rapidly transition between scenes, utilize and explore richer and more detailed settings and locales, and provide greater intimacy and interiority of the characters for audiences through use of different camera angles and shots. His mastery of the craft of directing, when put together with a talented cast of actors and a story that was already fascinating even without dramatization, and you have a film so captivating that the only moments where audiences could potentially tune out are the moments where the narrative stops for the performance of yet another iconic Four Seasons song. It’s truly a case of “too much of a good thing” — yes, the sound of the group, especially as performed by the ensemble and led by Tony-award winner Young, who brought the Frankie Valli role to life on Broadway in the first place, is what makes this story matter in musical history, but it’s not what makes the story so enjoyable to watch unfold in this form. It’s frosting on the cake, and it is possible to ruin a cake by piling on the frosting. To be fair, Brickman and Elice, who wrote the original book for the stage production and won Tony Awards for their efforts, do not simply transcribe their previous work song-for-song into the film; they re-work the order of songs at certain points in the film and they do excise songs entirely at other points. But what they choose to leave in place and utilize in the film still feels like too much, and they clutter what might have otherwise been a clean and smoothly-told narrative that would have been just as effective at holding audiences’ interest and leaving a lasting impression upon them. Perhaps they and Eastwood felt that had they removed any more songs that it would no longer be Jersey Boys, that it would lose its connection to the production that shares its name and continues to delight audiences on Broadway and around the world, and just become a biopic about The Four Seasons. Or perhaps they believed so strongly in the power of that iconic music and the talent of that cast, most of whom had inhabited these characters on stage at some point in their careers, that those elements in unison would be enough to hold on to audiences’ attention and overcome any drag all those songs might create on the narrative flow of the film. And perhaps with moviegoers who have strong memories and emotional ties to that time, place, and music, their faith will be rewarded with accolades and repeat viewings. But it won’t work that way for everyone. 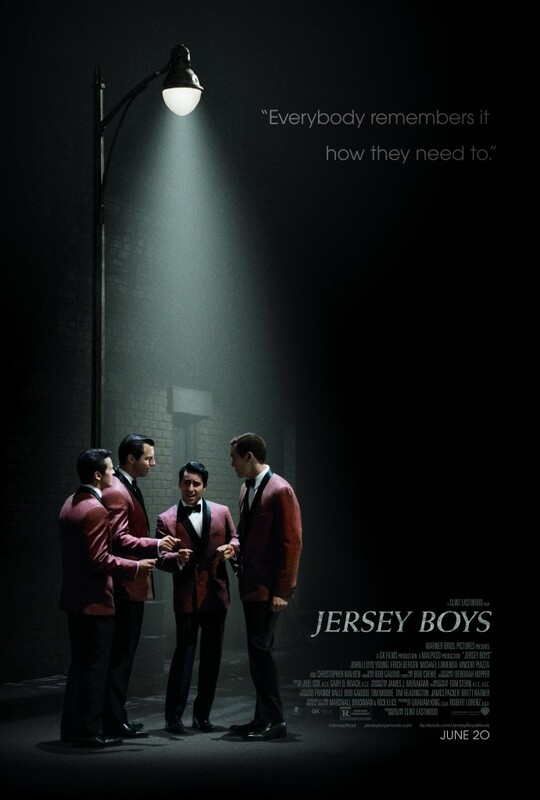 Those not caught up in the nostalgia the material is meant to conjure up and the quality of the cast’s performance all around will no doubt recognize that Jersey Boys the film is a film that’s not sure what it wants to be: documentary-style biopic or stage show adaptation. The basic incompatibility of those two very different approaches to entertainment is never more evident than in the film’s finale, a full-on song-and-dance medley of Four Seasons songs that serves as a curtain call for the cast. As well choreographed and rousing as the number turns out to be, it’s also jarring and incongruous with just about everything that precedes it. Like the whole film, it’s a well-intentioned effort, but it just doesn’t fit. Starring John Lloyd Young, Erich Bergen, Michael Lomenda, Vincent Piazza, and Christopher Walken. Directed by Clint Eastwood.